We now have a mailing list for the various Animal Grabbers. I’m looking for a 1979-1986 Fisher Price yellow foam-filled terry cloth Dexter dog head Animal Grabber that rattles when shaken. The dog head is shaped a bit like a ball with a loop through the middle for baby to hold it. 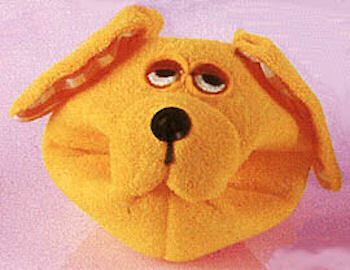 The dog has a long snout that is sewn to his bottom lip forming a loop. The dog has long rounded yellow terry-cloth ears with orange and white cotton checkerboard inner ears, and sleepy stitched eyes. It’s designed for children ages birth to 2 years old. I am desperate to find this dog for my daughter, who is due in July. It was my first toy, and I have worn it down all the way to the gingham lining. I would love to be able to give one to my daughter when she is born. Used condition is fine, and I would love to be able to find one by Fall at least. same boat. My sister and I both had them (and both still sleep with them) and have completely decimated them (with love). I periodically look online but haven’t had any luck. I too would love to find one! Anyone have any luck finding Dexter? My brother had one as a toddler and adored it and now he is about to be a dad and I would love to get him one for his baby. Is anyone looking for the bear? Thanks, Carrie. I don’t know if anyone needs the bear or not, so I sent the link to the mailing list, just in case.